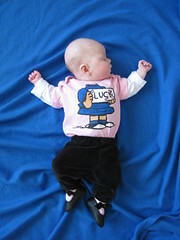 Auntie Katie picked up this too-perfect onesie a couple of months ago for Lucy. 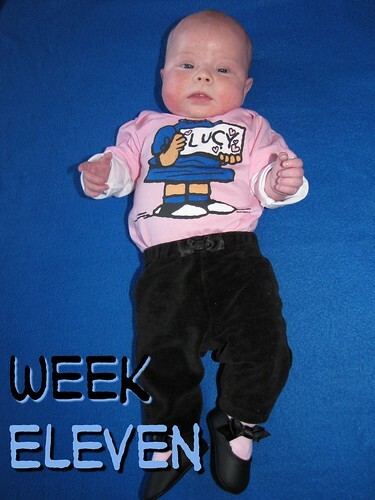 I was saving it for her 12 week photo, but when I realized that her 12 week birthday fell on Christmas Eve, I moved its debut up a week. I took a series of pictures of her like I always do, hoping to get one good shot and while I was uploading them onto the computer I realized she was kind of quiet. I peeked in on her in the living room and she was asleep! Modeling is not an easy job. Christmas is quickly approaching. The shopping is nearly done, decorating has been done for a while and even the Christmas cards are all mailed. Speaking of the Christmas cards...I went out on a limb and designed my own cards this year. I attempted to print them at a couple of places and was disappointed to find that no matter what I did or how good the preview looked online, the photo always cut off part of the text. So, I am sorry to have wished you all a merry holiday "seasor" - since 1/2 of the 'n' in season was cut off. How embarrassing. 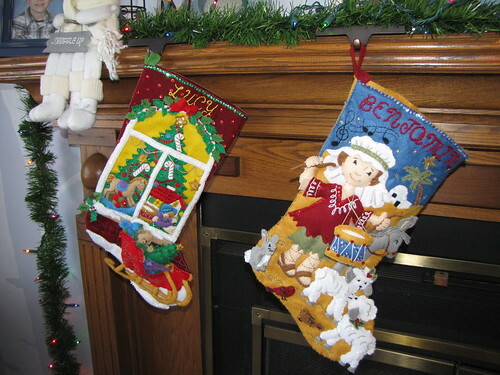 Years ago I spent months making a felt applique stocking for Benjamin. It was a tedious process, but I always vowed that I would do the same for any of our other children. Well, once again it took me weeks and weeks, but I finished Lucy's stocking yesterday. I honestly don't know what to do with my time now that it is done, but it feels great to see both stockings hanging proudly on the mantel. Now we just need Santa to show up and fill them!